Food writers are obsessed with service. We could produce reams on the subjects of niceties, like ambience and how lighting or tableware has the power to make or break a meal. What to do, then, when we review a casual family café with counter service? We simply ignore the baby who's making a mess at the next table and dig into the food with the steel-trap jaws of a pit bull. That's not to say that the scene at Richmond's Parkside Kitchen is the kind of free-for-all one might expect at, say, Friendly's. But it is certainly a contrast to the fine-dining destination Kitchen Table Bistro, for which owners Steve and Lara Atkins and Neal Johnston are best known. The James Beard Award-nominated culinary team has exported some of its casual hits, including burgers and mac and cheese, to the site of the former On the Rise Bakery. Don't look for the previous occupant's thriving music scene, bagels or vegetarian menu. In their place, pastry specialist Lara Atkins leads the kitchen in serving three meals a day. There are still lots of dishes to please veg-heads, but the broad menu is full of new treats that strive for the quality established at the Kitchen Table. Often, the food reaches those heights, but the climb isn't without stumbles. Service is simple: Consult a printed menu and order at the counter, then grab a drink from the case. A server will bring you your food and bus your dishes when you're finished. 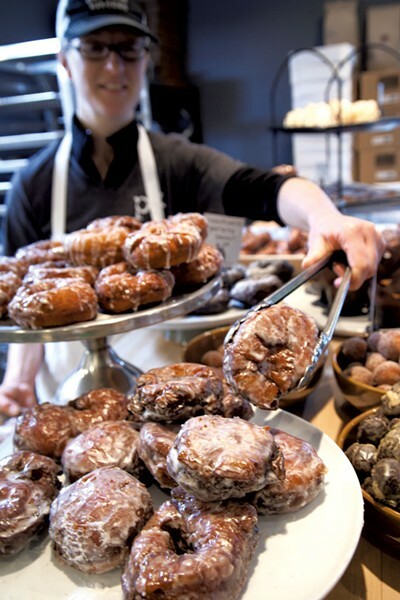 When it comes to the baked goods on the counter, you could try to resist an apple fritter or doughnut — or let your id rule. If a soft, chewy chocolate-potato doughnut will make you happy, why not indulge? Before I saw the apple fritter, I assumed it would be a member of the cider doughnut family. Instead, Atkins has replicated a glazed Krispy Kreme. The fritter was just as light, but instead of a hole in the middle it had spiced apples that melted into the feathery pastry. I tried those sweets when I stopped by Parkside for Sunday brunch and joined a full house of diverse diners — from country oldsters in overalls to young, hipster parents. We scored the last open table, a two-top next to the busy kitchen. My dining partner ordered a cup of hot chocolate, and after the first taste immediately spat out what he thought was paper. We informed our server, who offered a second cup with profuse apologies. When the same thing happened again, another staffer explained that the offending texture wasn't paper, but a film that developed on the drink as it sat throughout the day. He strained the chocolate and brought a final, smooth version — worth it for the rich, nutty sip. The drink made an indulgent pairing with the Parkside Benedict. This dish demonstrated that one of the best ways to trick me into eating my greens is by piling them under a thick layer of uncommonly tangy hollandaise. Atkins' take on the classic incorporated another idea that was even smarter: a base of polenta, lightly crisped on the griddle. Softer than an English muffin, the unassuming cornmeal put more focus on the toothsome smoked ham and crunchy pickled onions that joined the runny poached eggs in a tower of breakfast ecstasy. The Benedict looked small at first glance, but the calories added up to a nap. I expected similar pleasures from the Brunch Mac & Cheese, but was foiled. 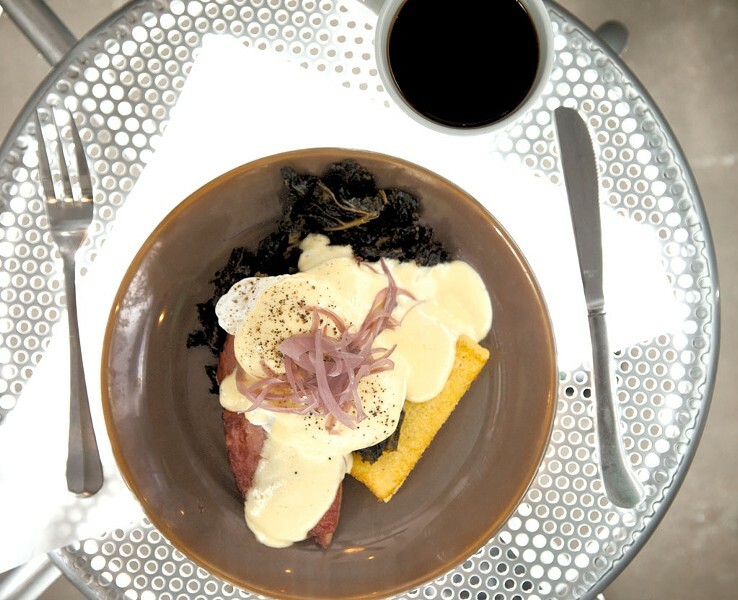 Elbows combined with ham and wood-roasted mushrooms, then crowned with a poached egg — what could go wrong? The answer came in the apparent lack of a roux. Instead of noodles covered in thick cheese sauce, what I got was a pile of pasta tangled in stretchy cheese, sitting in a pool of hot milk. On my next visit, the mac featured crisp-edged winter squash, roasted mushrooms and garlic, but the result was the same. The gooey, liquidy stuff that filled the cast-iron crock had a split personality, and I didn't like either of them. Parkside's take on the Cubano rescued that second meal. The soft slabs of focaccia framed all the usual suspects, including ham, pickles and yellow mustard. But a thick melt of cheddar and slices of house-roasted pork gave the sandwich an identity all its own. The meat was billed as "all-day roasted," and I believe it. I just don't know how the cooks were able to slice something so tender. A small side of creamy slaw added a welcome crunch, but a tangy side salad would have been a better respite from the heavy sandwich. On my third visit to Parkside I resolved to get some veggies — not much of a challenge. The menu offers no fewer than four salads, including one tempting combo of wood-roasted beets, pickled fennel and feta. Another combined warm shell beans with quinoa and herbs. I settled on a bowl full of chopped romaine, cubes of roasted squash, juicy apple and chunks of cheddar. Slightly overdressed in a puckery vinaigrette, the salad had a wilted look but was still refreshing alongside my heavy entrées. In the grand tradition of On the Rise, Parkside serves pizzas, but only from 4 p.m. until closing at 8. Enticed by the gluten-free polenta pizza, I nonetheless stuck to the basics, ordering the "house concoction" of pepperoni and roasted mushrooms over house tomato-basil sauce and cheese. The pizza arrived with pepperoni, but no mushrooms. It didn't matter much; I was all too happy to tear into the skinny, personal-size pie and its tangy layer of sauce. The crust was soft but sturdy enough to hold up beneath its toppings. My dining partner was worried by the dearth of cheese, but the combination of mozzarella and sharp grana Padano held enough power to satisfy him. The final dish we tried at Parkside Kitchen was the best of all. Let's put it this way: Nectar's in Burlington now has competition for best fried chicken in the state. 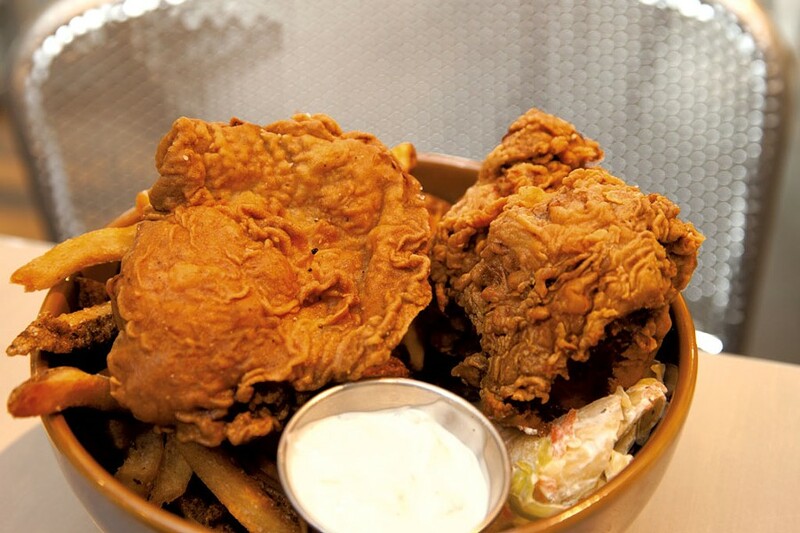 At Parkside, $14 gets you a thigh and breast, both flowing with the juice of a buttermilk brine. While ultra-moist, the chicken never soaked away the crunch of its own coating. And what a coating! If you'd told me there was such a thing as fried chicken that tastes like movie theater popcorn, I might have told you that sounded gross. I would have been wrong. I don't know what alchemy Atkins uses, but the result is wild indulgence. Paired with crisp, pepper-laden, hand-cut fries, the result is certainly a "sometimes" food, but one to mark the calendar for. I'll probably skip the sides of clumpy buttermilk dip and mayo-soaked slaw next time, but the central elements are so compelling that I may even be willing to try the version of the dish in which southern-fried tofu replaces chicken. Of course, there are other dishes to try first. Lasagna made with layers of polenta in place of noodles looms large on my list. So does a rice bowl with smoked tofu and minted yogurt. And if hungry locals keep Parkside thriving, I'll have plenty of time to eat my way through the menu. The original print version of this article was headlined "A Bite of the Park"